With everyone in the right place at the right time for the expedition’s assembly, our convoy of Land Rovers started slowly snaking its way into the land of the snow leopard. Although well east of the Ural mountains, and therefore firmly inside Asia, Novosibirsk feels decidedly European. Caucasian faces dominate and so does European architecture and culture. 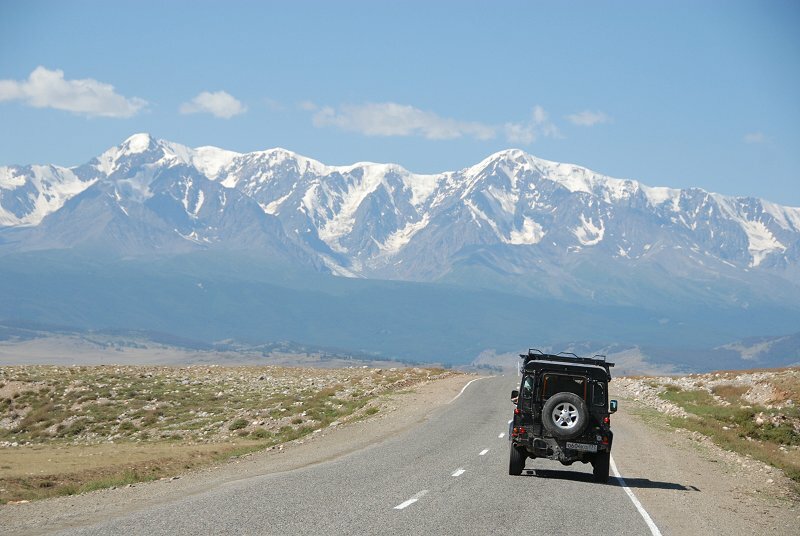 On the 1000 km drive to the Altai, we pass through flat landscapes with cities and huge fields on day one, before crossing the border to the Altai and into some hills towards the end of the day. It still feels like Europe. Last night we spent at a half-way camp for a first taste of the tent camp life that awaits in the Altai. It’s been raining a lot in the hills and mountains for the last few days, so after the dust of the road, we mostly stuck to the mess tent. Today we will drive deeper into the mountains, via three passes, leaving a bit more of Europe behind on each one. By the time we’ve crossed the third path, horses, Asian faces and strange non-Cyrillic script will make it feel like we’ve truly left Europe behind us and have arrived in Asia. At the moment, however, we are still waiting for our permits, before we can drive off. Rumour has it that someone in the office in Gorno Altaisk where we are usually issued our permits was sacked a few days ago, so they simply shut up shop and we were faced with rolled-down shutters. After nine years of running this expedition you would have thought it is plain sailing. But bureaucracy here is ever resourceful in making things difficult. So you just have to be flexible and go with the flow, otherwise you’d just get an ulcer 😉 Being flexible in this case will mean a luxurious lie-in for the team in their camp beds and some animal ID, navigation, safety and other training sessions at our half-way point until the permit issue is sorted. Stay tuned for updates on our progress, which will decrease in frequency now as we leave the internet, mobile phone coverage and other technical wizardry behind. Our connection to the outside world at base will be an (expensive non-broadband) satellite system, so please bear with us for the next update.